No sign. No name. 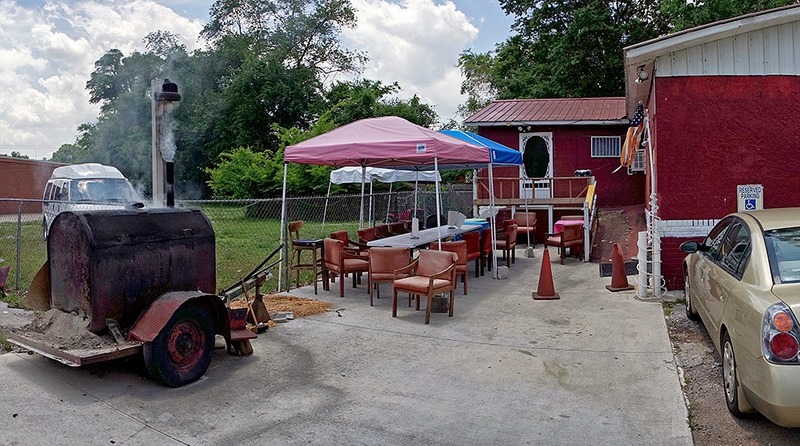 No indication that this place in a fairly run down inner-city subdivision of Huntsville next to a cemetery, is a BBQ restaurant, than the smoke that is coming from a mobile barrel smoker at the corner of the premises. You park either in one of the two parking spots on a gravel patch beside the house, or on the street. In the courtyard of the L-shaped building are some camping-canopies with well worn out leather chairs. A few orange traffic cones adorn the pavement. The entrance to the dining room is a simple red door. The dining room is surprisingly big, and not surprisingly dark. 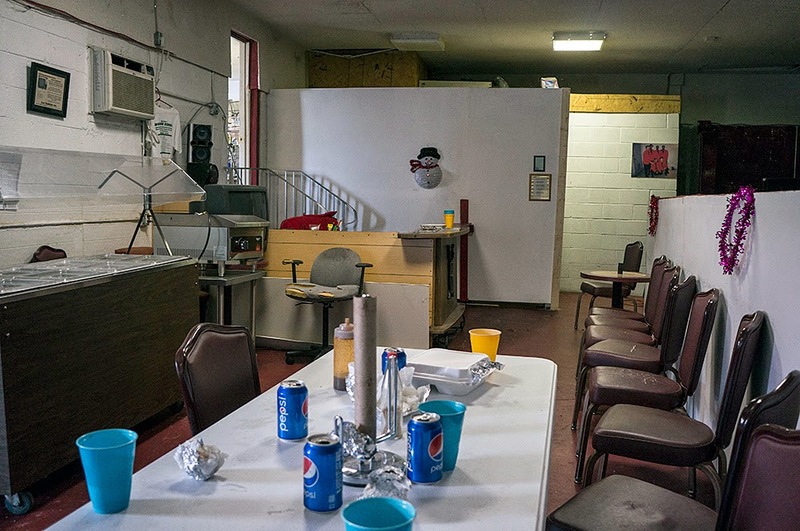 There is one camping table with six camping chairs, half a dozen of those well worn leather chairs along a three foot high wall, and a counter with an old office chair behind it that has an old shirt lumped over it that says “Melvin’s Place of BBQ”. Next to the counter stand an old TV, and some buffet gear. On the other side of the room, beyond the three foot high wall that separates this area from the dining area, and where it is really dark, there is a small stage with some musicians gear on it, several other camping tables, more buffet gear and other things. On the walls, there is one picture of a 1960s era soul band, and a framed article of the Huntsville Times about this place. Some would call it a dive. Some would even call it a dump. Others would call it authentic. I would call it all of the above. To be very clear – it is not a dirty place, not at all. It is just well worn, odd, eccentric, cobbled together. 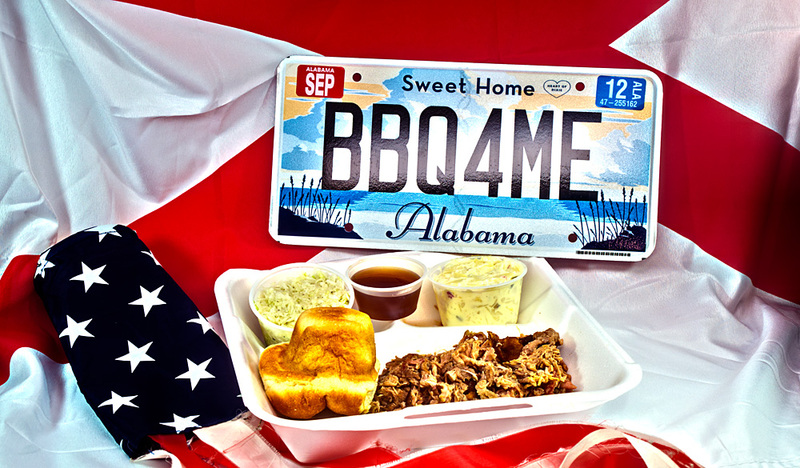 The owner, Melvin, is a very nice old man, with a serious passion for BBQ. When I asked him about his secret how to cook such a marvelous BBQ, I got a fifteen minute lecture. No, actually it was more like a sermon, with fire and brimstone, and preaching and praying. Melvin does not believe in wood. He uses whatever is on hand – hickory, pecan, cherry, it doesn’t matter. The secret to get the flavor in the meat, he told me, is the rub, not the wood. He does his own rub and his own BBQ sauce – actually, he has nine different sauces, and each of them makes the chicken taste differently in combination with the rub. Melvin also does not believe in smoking the meat for hours. He has better things to do than fire up the smoker in the middle of the night, he said. Forty-five minutes is sufficient for a chicken - that is his believe. He also does not turn the meat halfway through the process, nor does he poke it with a thermometer, lest the juices would drip out. With all that, he is the most unorthodox pitmaster I ever met. But his chicken proves him right – it is divine. DIVINE! I had heard so many good things about Melvin’s chicken that I broke with my rule to have pulled pork at each new BBQ place. 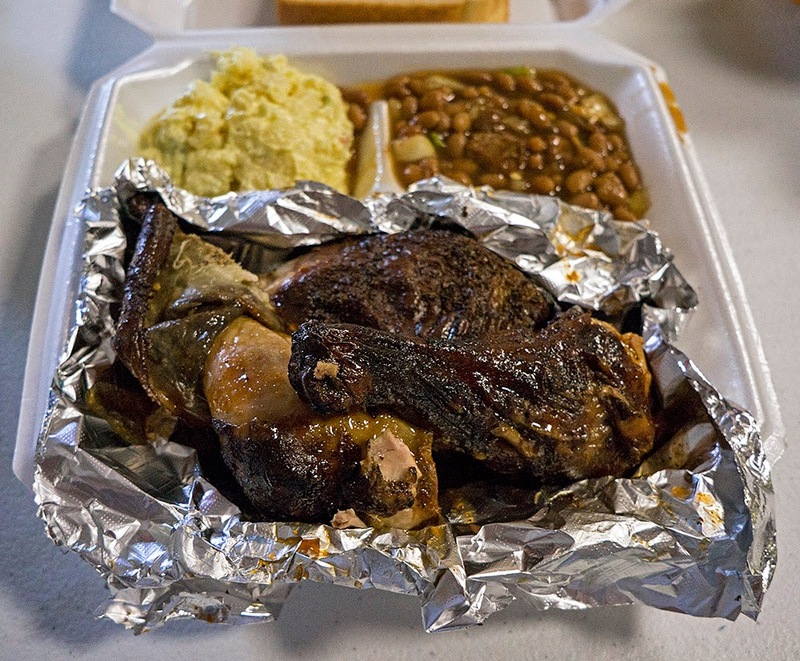 The plate, rather the Styrofoam box, came loaded with two slices of regular toast (untoasted), baked beans, potato salad, and a two drumsticks and a chicken breast. The chicken was sitting in a puddle of his BBQ sauce (which of the nine different varieties, I have no idea), that apparently oozed out from the skin. The skin was a bit leathery and not crisp at all, but the meat under it was the most tender, juicy, flavorful and, yes, divine chicken I ever had. It had a very nice smoke aroma, too – something you do not necessarily expect with a smoking time of only forty-five minutes. The potato salad was top notch as well, being a mayonnaise based, fairly sour, concoction. The baked beans were okay, but nothing to write home about. They swam in a thin liquid and had some vegetables and meat in it, but the taste was really nothing special. With a can of soda, I paid eleven bucks (the lecture was priceless, yet at no cost), which is more than can be usually expected in such a location. But it is well worth it, and I can only suggest that you let the, well, ramshackle environment and the very interesting interior design of the restaurant not deter you from what would become a defining moment in your live – when you take the first bite out of Melvin’s chicken. It is just divine!